What comes to mind with the name Thomas Jefferson? President, perhaps? Avid agriculturist and gardener also fit, especially in Jefferson, where locals are quick to share this rich history. Jefferson frequently extolled the virtues of the agrarian life and championed self-government. 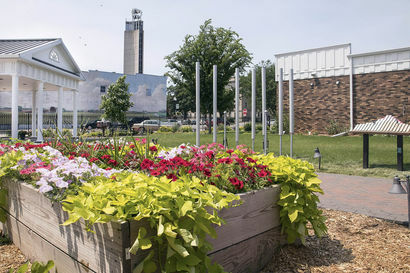 His legacy and ideals are honored on in the Thomas Jefferson Gardens of Greene County, Iowa (TJGGCI), in downtown Jefferson, thanks to dedicated volunteers, local civic groups and other community-minded supporters. A life-sized statue of Jefferson himself greets visitors to the gardens, which surround the local Welcome Center/chamber of commerce office southeast of the Greene County courthouse. “The statue is so lifelike that I think a person is sitting there when I catch a glimpse of it while I’m working,” said Jean Walker, head gardener and secretary of the TJGGCI. So what came first in Jefferson—the statue or the garden? It all started in 2010 when Wallace Teagarden, a Greene County native, lawyer and long-time admirer of Jefferson’s philosophies, wanted to combine his love of agriculture and Greene County in a lasting legacy to the author of the Declaration of Independence. Teagarden commissioned Jon Hair, an Iowa native and world-renowned sculptor, to create a statue of Jefferson. While displaying the statue on the courthouse lawn was the original idea, it was decided that the statute should become focal point of the new TJGGCI, located just down the street to the east of the iconic Mahanay Bell Tower. A great deal of work went into creating the nearly $1 million gardens that visitors enjoy today. “This lot where the gardens are had three dilapidated old buildings on it that had to be removed,” said Mary Weaver, who leads 12-member volunteer board of the TJGGCI. The ground itself wasn’t ideal, either. Old cans and other debris were buried in the corner behind the area where a filling station once stood on the property. “Multiple truckloads of soil were hauled in here,” Walker said. Before some of the first plants could even be planted, grant writing and fundraising were essential. Project leaders received grants from Vision Iowa and Grow Greene County, along with support from Alliant Energy, West Central Cooperative (which is now Landus Cooperative, the Greene County Board of Supervisors, and countless other groups and individuals. • The farmer’s garden on the east. Volunteers have grown broom corn, white corn, pumpkins, squash, Yukon Gold potatoes, flax and more in this garden, which is near a replica of Jefferson’s “mouldboard of least resistance” for a plow. While serving as minister to France, Jefferson had the opportunity to observe European plow designs. Their deficiencies inspired him to design an improved moldboard (the part of the plow that lifts up and turns over the sod cut by the plow share). He wished to make that lifting and turning action as efficient as possible so the plow could be pulled through the soil with the least expenditure of force. He never sought to patent his design and sent numerous models to friends at home and abroad, where his design met with general approval. • A prairie garden on the north, filled with native plants. “This is what Lewis and Clark would have seen when they explored Iowa following the Louisiana Purchase,” Turpin said. • A children’s garden, with beds made from old wagon wheels. This fun garden showcases unique plants like the sensitive plant, whose leaves and stems curl up when touched. • A flower and rose garden on the west. This garden is filled with 1,000 plants, including many perennials ranging from irises to daylilies. This garden also includes Buck roses, which are hardy varieties developed by Dr. Griffith Buck from Iowa State University. In addition, some of the plants in the garden have been donated from local gardens, including two peony plants that are more than 100 years old, Walker said. Those are located near the garden’s striking pavilion, a Federal design reminiscent of architectural styles associated with Jefferson. Even the little free library in the garden near the pavilion reflects Jefferson’s legacy, since it’s designed to look like Monticello, Jefferson’s estate in Virginia. Since Thomas Jefferson was interested in music as well as agriculture, the TJGGCI project leaders added whimsical, larger-than-life musical instruments, including a contra base chime and xylophone, to bring sound to the garden. So far, there has been one wedding in the garden in 2016. Tour groups from Des Moines to South Dakota have also visited the gardens. Volunteers continue to work to make the garden even more inviting. They hope to add a third musical instrument and are hosting another year of Tuesday Talks. These free, educational lectures are held in the garden each Tuesday from noon until 1 p.m. through mid[August. Topics range from perennial gardening to birds in the garden. “A garden is always a work in progress,” Walker said. “On a very pleasant note, we are getting visitors because of the articles. We have, that we are aware of, three different sets of visitors from Humboldt. It is the type of visitor story we will tell the City Council when we report to them in September. The best anecdote was a woman who was part of an assisted living bus tour that was coming to Jefferson from Humboldt, but the destination was the casino. She persuaded the driver her to bring her to TJG rather than the casino and she stayed the entire length of time the others were gambling. The second was a couple I met yesterday during Tuesday Talks. It was their second visit for a “Tuesday Talk,” they ate at a local restaurant, went shopping at the quilt and antique store.